Due to various technological advancements in medical science, the medical industry is able to present various alternative therapies to treat injuries and degenerative joint pains. While some people are willing to undergo traditional therapies, including invasive surgery, some people prefer less risky routes. At OCWellnessphysicians.com the advanced treatment options including stem cell therapy are used to treat joint conditions and arthritis effectively. Amniotic stem cell therapy is conducted using amniotic stem cells located in the amniotic sac and not embryos. The option of stem cells from amniotic sacs is to adhere to moral and ethical issues regarding the use of embryonic stem cell therapy. Many people are unwilling to use embryonic stem cells from an ethical perspective but are unconcerned with amniotic sac cells. The team at OC wellness acknowledge this issue and can use the latter type of stem cells to treat patients. OC Wellness Physicians Medical Group is one of the few groups in the country offering both umbilical and amniotic stem cell treatment. Our team of medical doctors, chiropractors, and medically trained nurses will assess the cause of your problem and determine which joint tissues have degenerated. By using this initial assessment, the team can remove chronic joint pain using specialized stem cell treatment. Stem cells are located in all areas of the human body and play vital roles in the body’s natural healing process. Our inherent stem cells tend to remain dormant until they receive a ‘message’ from the brain that the body has experienced injury or damage. Once this ‘message’ is received, the stem cell accompanies platelets to target the injured or damaged area. The cells are unique as they have the ability to transform into the type of cells that were damaged or injured; thereby, promoting the natural healing of the human body. Using this transformation process, it is possible for stem cells to heal bones, tissues, tendons, and ligaments. As a person ages, the number of stem cells available to repair an injured area reduces. Stem cell treatment can resolve this issue by delivering injections of concentrated stem cells directly to the damaged or injured area. These injections promote natural healing without the use of invasive surgery or pharmaceuticals. Furthermore, stem cell treatment is speedier than the traditional medical treatments and can be conducted using an in-office or outpatient procedure. How Does Regenerative Stem Cell Therapy Work? Regenerative stem cell therapy operates by using the body’s inherent ability for self-healing. Amniotic regenerative stem cell therapy requires the physician to inject stem cells into the painful area with the amniotic tissue. The stem cells have healing qualities, as well as anti-inflammatory components; therefore, this treatment offers damage reparation with anti-inflammation while medication offers only acute pain relief. 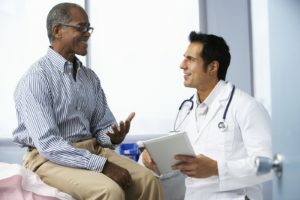 The injected stem cells have the ability to heal help the damaged area within a stipulated healing time by aiding in the production of new connective tissue. Furthermore, the injections contain hyaluronic acid – a component that assists in lubrication of tendons and joints resulting in pain relief. The stem cell is unique and that it has an exclusive ability to transform into any type of cell in the body. This is why stem cell treatment is considered by some, a comprehensive form of alternative medicine. Once the damage is repaired, the results are permanent and you will not have to deal with any chronic or acute pain. How Is Stem Cell Treatment Alternative To Other Types Of Therapies? Traditional medical procedures for painful joints tend to rely on medication and invasive surgery; however, stem cell therapy is a suitable substitute to promote natural healing within the body. This type of treatment is one of the most minimally invasive approaches when training injuries and pain. Regenerative stem cell therapy can be performed at the Stem Cell Institute of America and patients are able to gain pain relief without any risks of invasive surgery or lengthy rehabilitation periods. The treatment is safe and effective, as well as having some of the advantages listed below. As is mentioned, the amniotic stem cell treatment is a secure and reliable alternative. The treatment is rare, but evidence has shown that it does not have patient rejection which is why medical professionals recommend its use. This type of stem cell is a neutral format meaning that the stem cells do not present with any DNA. Without any DNA, all people will match the stem cells and transference of stem cells to the body can be conducted efficiently. Our objective at OC Wellness is to offer patients pain relief via inherent healing with permanent results. In the majority of cases, the therapy requires a single injection and the patient will see a result without four or five weeks. Evidence has found that stem cell treatment can help a patient return to their daily routine speedily and the treatment is used to heal cardiac disease, tissue damage, neurological problems, immune rejection disorders, and many other medical conditions.